A Czech computer-animated adventure that broke box office records in its native country, Harvie and the Magic Museum is a charming tale, despite featuring one of the most annoying protagonists you're ever likely to come across in a film for children. School kid Harvie is, frankly, pretty awful – to adult eyes, at least. While he appears cheeky when we first see him speeding on a scooter through his quaint town, it soon becomes apparent that he's a self-centred little brat who stays up all night to play his new computer game and screams horrible things at his poor father when he accidentally breaks Harvie's precious computer. Oblivious to the fact that his dad's job is in jeopardy – the puppet museum where he works is due to be demolished – Harvie misses a school trip due to his laziness and, following a misadventure involving a digging machine, ends up tumbling down a hole in the road with his dog Jerry and friend Monica. The trio find themselves beneath the museum in a hidden room with a magical seal that resembles a computer gamepad. Naturally, Harvie plays with it and, in doing so, brings to life not just the friendly puppets in the museum, but also an evil puppet master named Bastor bent on destroying the town. Harvie – otherwise known as Hurvínek – and his father Spejbl are well-known characters in the Czech Republic and beyond, first created by Josef Skupa as a comedy puppet duo back in the 1920s. Their slightly unusual look (large eyes, bobble nose) has been neatly recreated for this modern update, from Martin Kotík and co-director Inna Evlannikova, and it works well with their quirky surroundings – a beautiful pastel-coloured town of cobbled streets and uneven houses – and the oddly adorable marionettes they encounter. Parents, of course, will figure out early on that Harvie will have to become a better, less selfish boy to save the day, but children will be too thrilled watching the flying dragon and larger-than-life magician Bastor to be bothered by any predictability in the plot. 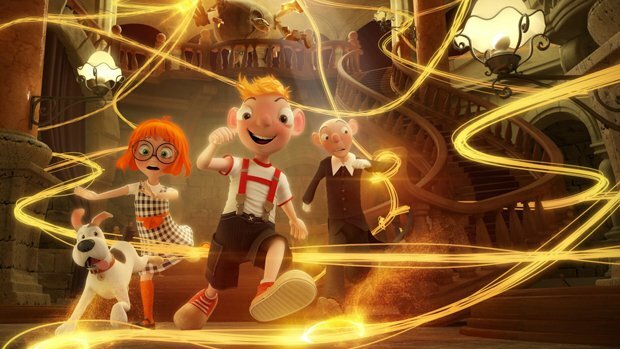 Harvie may not have the multiple layers that give many a Pixar offering cross-generational appeal, but it does have humour, a brisk pace and a touch of scariness that will entertain younger kids and mildly amuse adults along for the ride.